Devarshi Kala Nath Shastry, (b. 15th July 1936) a celebrated Sanskrit scholar honoured by the President of India (1998) is not only an Indologist and a prolific writer of Sanskrit, Hindi and English but also a linguist who has contributed richly to the campaign of evolving technical terminology in Indian languages and ensuring a respectable status to Hindi, the official language of his state and the Indian union. He has continued the rich tradition of introducing modern genres and modes of expression in an ancient language like Sanskrit for which his father late Bhatt Mathura Nath Shastry is known in the history of Sanskrit literature. He has authored more than a dozen books and edited equal number in Sanskrit, Hindi and English and is known for his interliterary translations of monumental works of Philosophy and literature in these languages and also Prakrit, Vraj Bhasha, Rajasthani and other Indian languages. 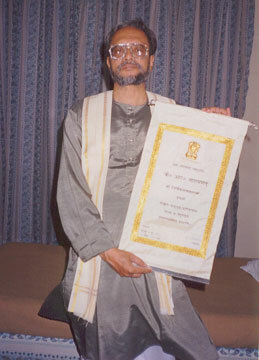 He has contributed more than a thousand articles in Hindi and Sanskrit to reputed journals of India and broadcast more than 200 talks, poems, plays etc. in Sanskrit, Hindi and English. As a literary historian, critic and commentator he has made a mark on the creative literary scene of Sanskrit in the second half of the twentieth century. In the history of modern Sanskrit literature he is known as a distinguished fiction writer who has introduced a modern idiom in creative Sanskrit writing through his novels, short stories and personal essays. His books on the 20th century Sanskrit literature form the foundation of the history modern Indian literature. As the chairman of the Rajasthan Sanskrit Academy(1995-1998) and the Director of Sanskrit Education and Bhasha Vibhag(1976-1994) his contribution to the development of Sanskrit and Hindi languages has been valued as remarkable all over the country.